Published since January 1998. Frequency of publications : 4 issues per year . VESTNIK OF MSTU is a scientific edited journal which publishes articles, reviews on the results of theses written for PhD and Doctorate degrees. In accordance with the Order of the Russian Ministry of Education and Science d. d. July 25, 2014 No 793 «…Academic periodicals whose currents issues or their translated versions are included in at least one of the international databases or citation systems Web of Science, Scopus, Astrophysics Data System, PubMed, MathSciNet, zbMATH, Chemical Abstracts, Springer, Agris or GeoRef are considered to be included in the List of science fields, corresponding to their profile…». VESTNIK OF MSTU is registered with Federal Service for Supervision in the sphere of Communication, Information technology and Mass Communications as a periodical publication. 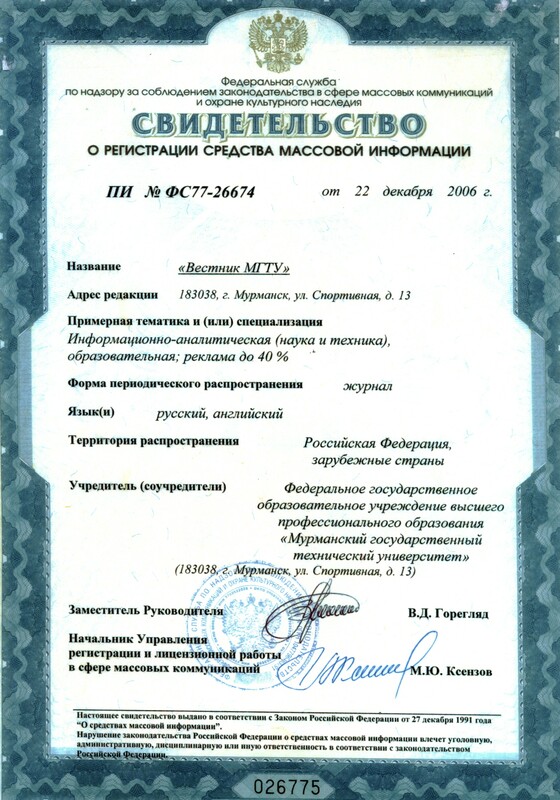 Certificate of registration of a mass communication medium ПИ № ФС77-26674 dated December 22, 2006.